Welcome to the web site of science fiction author John J. Lumpkin. 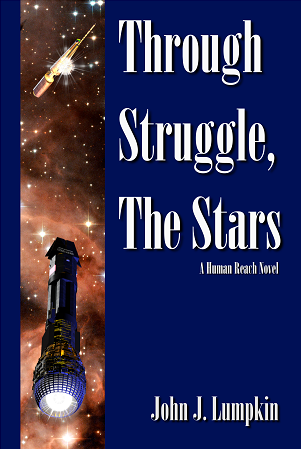 The Human Reach is the setting for the novels Through Struggle, the Stars and The Desert of Stars, as well as future books. It is a world in which the laws of physics are obeyed, and the politics are an all-too-real extrapolation of today's. The first novel, Through Struggle, the Stars, begins in 2139. A network of artificial wormholes has allowed humanity to reach nearby stars, where nations fiercely compete to settle new colony worlds. War is imminent between Earth's great powers for reasons no one fully understands. Midwest Book Review calls Through Struggle, the Stars "a fine and fast-paced read, very much recommended" and the venerable Analog magazine praises it as "all good, great fun." On Amazon.com, it has been ranked in the top 10 bestsellers in War fiction and Space Opera, and in the top 600 books overall. 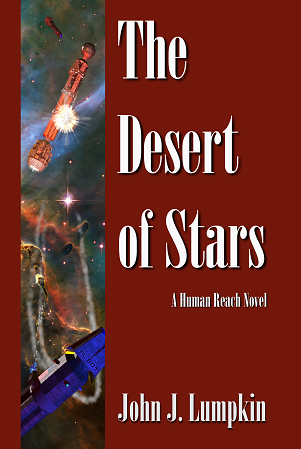 The sequel, The Desert of Stars, was released in March 2013. Both stories, and this web site, feature art by renowned science fiction illustrator and Atomic Rocketeer Winchell Chung. Plot summaries for my novels are available on the Books page. For more details on the Human Reach, check out the Setting page. To find other readers and fans, please visit the Community page. Thank you for your interest!